Her astute mindset, ability to achieve at such level, without a lawyer has been proven already for years and we are proud to be part of her movement across our nation,as she has learn more than any ostensible lawyer,and critical thinking along with her passion for JUSTICE of America's most innocent has already been firmly established throughout her win as validated." 1-929-277-7848. The founder/boss/owner Melendez (ext. 806) has won(involving her timely filed by DEADLINE lawsuit against child protection worker's, she WON her right to see her and her girls,(her daughter's violated) and their $50MILLION DOLLAR suit, filed pro-se without a lawyer,WON the right to sees their well handled suit move forward. Proving all lawyers coast-to-coast wrong. Law school is now her daily focus 24hours a day,and shall be in due time, accomplished. Media news has aired her story,and validate her winning such relevant significant decision,as she continue to be there for those who are sadly, still violated,and are attempting to sue pro se,by deadline DFPS employee who has violated a good parent,family civil rights." Then call to begin your 1-on-1 POWER session same day." DFPS sued for a violation premise on a wrongful detention of one's beloved child. throughout cities in Texas DFPS continue to violate. HOWEVER more are now sued. A Texas investigator/caseworker/CPS employee has lost the right,as the agency et.al., to not be sued, ergo, are being held accountable,in another recent decision,and we are happy to see again, another prudent judge! Such recent #TexasDFPSLawsuit win encompass but not limited to a dfps employee falsifying records and or statements, twisted such truthfulness involving a loving parent,and the children, then lied under oath during each hearing, perjury to a material fact and as a result, has harmed such good loving family for some time. The other recent win is a child age 16 along with other younger children, won the right to see their own civil right damages suit move forward as verified for analogous to the adult lawsuit filed against Texas DFPS. ​Our e-staff shall keep you posted,when you're calling in. and statewide per assigned employee DFPS violation, by deadline..."
TO SUE FOR ONE'S CONSTITUTIONAL RIGHT. NORTH CAROLINA LAWYERS SEEMINGLY ARE NOT CARING ENOUGH TO SUE FOR THE "TRULY INNOCENT..."
no lawyer "care"enough to sue. Do not Fret. ext. 102 . STATE court who has already per day cause yourself so much agony. In U.S.District(Federal Ct.,)such court has done what was right repeatedly, unlike state." Such jurisdiction, as multiple case law(s)support,will review your lawsuit, and fairly consider such for money damages,encompassing per claim,(correctly stated)for such warranted relief, premise on the DHS and or your local texas DFPS, to OK DHS inequities,being exerted,against you,and harming as a result your family. YOUR REMEDY IS AVAILABLE,WHEN ATTEMPTING TO HOLD CPS ACCOUNTABLE EVERYONE. IF AN OKLAHOMA CASEWORKER Employed by DHS has not been at all truthful,distort the actual "facts"
-children have been unlawfully removed,from your care, then placed for adoption illegally/unconstitutionally. YOUR CHILD FILE SUIT.DEADLINE IS NEAR PER DAY YOUR STILL "COMPLAINING BUT NOT YET TAKING REQUIRED ACTION." 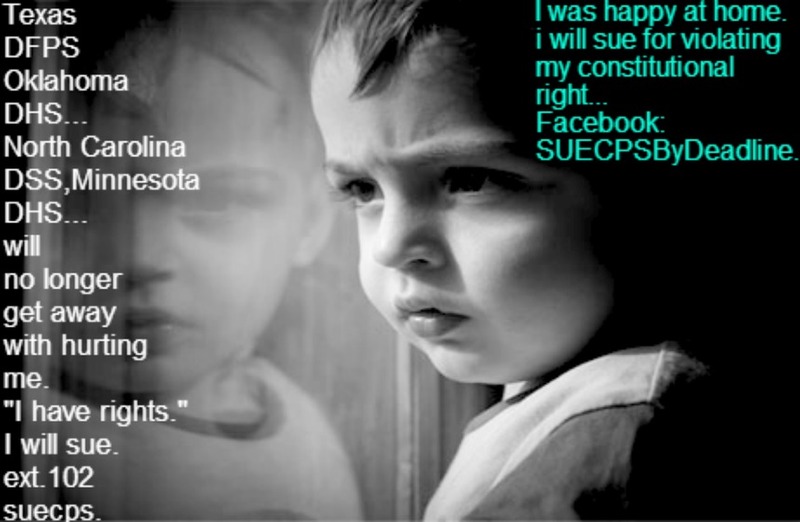 ​ No longer an excuse not to when your able to sue,and TIMELY BY DEADLINE,known as pro-se."